Hitting The Wall. One minute you’re cruising along, legs pumping rhythmically beneath you, and the next minute you’re brought to a grinding halt. Colours dim, noises quiet, clouds roll in. Your legs start to feel heavy and disconnected from the rest of your body. Your movements become difficult and uncoordinated. Your thoughts turn inwards and your eyes droop downwards. No matter what you do to talk yourself through it, The Wall seems to grow higher, wider and stronger with each passing step, taunting you to give up. If you’re a runner, chances are you’ve hit The Wall at some point in your athletic career. If you’re an ultrarunner, its probably happened at some point this week or month. Hitting The Wall, or ‘bonking’ as it is more colloquially known in the states, is one of the most common setbacks experienced by runners in training or in a race. While it can be a terribly frustrating experience, The Wall is avoidable with the right kind of training and nutrition, and manageable with the right kind of attitude. However, when you live and work in Palestine, you run the risk of hitting another kind of wall – the visible, tangible kind – which isn’t nearly as easy to deal with. In 2002, Israel decided to build a separation wall between Israel and the West Bank in order to regulate the entry of Palestinians into Israel. 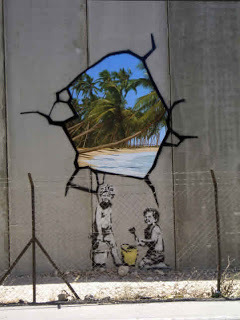 The manner in which the wall has been constructed fails to respect the Green Line with eighty-five percent of the wall being built within the West Bank itself. * Despite being recognized as illegal by the International Court of Justice in 2004, the wall has continually grown over the past twelve years. The total length of the wall will be around 700 km, comprised of 8 meter high concrete blocks and 2 meter high electronic fences. Maintaining my running life while living in Gaza continues to present a few, cough, challenges. Even when I’m able to physically escape on the weekends – to Tel Aviv, Jerusalem, or otherwise – it is pretty hard to mentally escape sometimes. Especially when I keep hitting The Wall(s). But I’m sticking with it and I’m grateful for every chance I get to move outside. 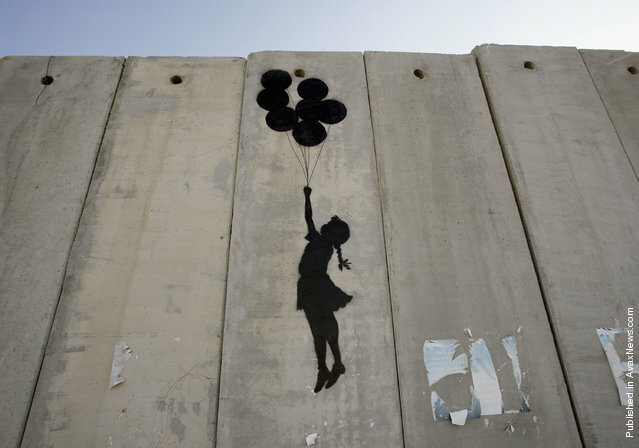 It is actually what has inspired me to sign up for the Palestine Marathon in March 2015, which takes place in Bethlehem. The purpose of the race is to celebrate the right to freedom of movement, but also highlight how Palestinians are unable to exercise this right due to the occupation (and related infrastructure, including the wall). The course runs along the wall and through refugee camps, and in doing so, helps to promote better understanding of the current situation through running. To be honest, I hate running road marathons, but I’m a big fan of the idea behind this race. Anyhow, it is less than four weeks to go before the Vibram Hong Kong 100, so I’ve got to do what I can to prepare! Luckily, I’m off to Cyprus for the weekend for some mountain therapy over Christmas, which is just what Santa Claus ordered. Stay tuned for my end-of-the-year blog post from Cyprus! Do at least one long run a week: Hitting the wall is usually a result of having used up your glycogen (stored energy) in your muscles, causing you to slow down significantly. By doing progressively longer training runs every week, you increase your body’s ability to store glycogen, meaning that you won’t tire as quickly or easily. You also teach your body to use energy reserves from fat once your glycogen is depleted. Speed up: Try speeding up to race pace for the last couple of kilometers of your longer runs. Running at high speeds when your body is already fatigued will help you become more familiar with how you might feel on race day, and will help your body (and mind) learn to run more efficiently at higher speeds. Fuel your body: Once your body starts to deplete its glycogen stores in your muscles, it turns to sugar in your blood and liver glycogen to keep it going. Make sure to take in some carbs for any runs over 90 minutes to keep your body fuelled. Pace yourself: One of the biggest rookie mistakes is to go out too fast, especially on race day. It is easy to get caught up in the excitement and burst out of the gates at a high speed; however, you run the risk of burning through your stored glycogen too early. It is better to hold back a bit at the start and save some energy for later in the race. Stay positive: If you hit The Wall, it can be really difficult to overcome, but remember, it is possible. Pull back, rest, fuel – do whatever you need to do – but don’t give up. Oftentimes after a bit of sugar and a short break, you can get your second wind and continue on. *The Green Line is the armistice line negotiated after the 1948 Arab-Israeli war demarcating Israeli land from its Arab neighbours. It held until the Six Day War in 1967 when Israel captured the West Bank, including East Jerusalem, from Jordan, along with the Gaza Strip from Egypt and the Golan Heights from Syria. These areas have been occupied by Israel ever since, which is illegal under international law (and has been recognized as such in UN Security Council resolutions). The Green Line is often cited as the basis of a two-state solution. For more reading, see this NPR backgrounder here. Is the Palestine marathon open to non-resident (I mean how difficult is it to enter)? I might know of a few guys here in Kuwait that would love to bring something into action by running it. It’s totally easy to enter – just sign up! 🙂 Open to anyone. As a foreigner, you can just take a taxi into Bethlehem. Greetings from Canada (Vancouver Island) and Best Wishes for a Merry Christmas! Thank you so much! Merry Christmas to you too and a happy new year! How nice that you are on Vancouver Island. Beautiful 🙂 Thank you for continuing to follow my blog! Learning a new activity usually motivates me. I tend to feel good about myself and I’m able to push myself to do things I’m not motivated enough to do. I strongly believe that motivation comes in bursts, I try to act when I’m at my peak. I remember the worst time I hit the wall was in HS. I was running the 800 meter leg in a sprint medley. Well I was a jumper filling in an needless to say I went out too hard on the first lap and payed the price lol. I just came across your blog and love it! Can’t wait to keep reading it! Fueling your body the correct way is the best strategy to avoid the dreaded wall. I hit the wall many times in my tough mudder events. Over years of this problem I finally nail it down to fueling the body correcrtly. Each body is different so you have to find what works for yours.